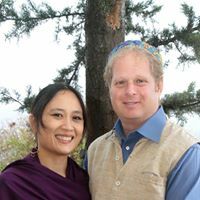 Rabbi Or Zohar and his wife Feliza Zohar will co-lead this Shabbat service with the Temple Isaiah clergy. They will share some of their original compositions of sacred music accompanied by local musicians and the Temple Isaiah choir. Rabbi Or Zohar is a musician, teacher of Jewish Spirituality, and a Jewish Reform entrepreneurial activist. He serves as the reform rabbi of Misgav Regional Council in the Central Galilee. Rabbi Zohar is the former rabbi of Congregation Ma’alot Tivon in Kiryat Tivon, and former founding rabbi of Kehilat Halev in Tel Aviv. Rabbi Zohar received his rabbinic ordination from the Jerusalem campus of HUC-JIR and has a Masters in Jewish Philosophy from Tel Aviv University and a Bachelor’s degree in Jewish Thought and Indian Studies from Hebrew University of Jerusalem. He is currently working on his PhD in Jewish Philosophy at Tel Aviv University. Feliza Bascara Zohar is a multidisciplinary artist, singer-songwriter, and choreographer.